Team up for great justice! 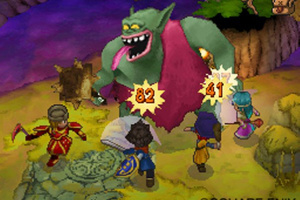 Japan is getting ready to be gripped by Dragon Quest fever with the upcoming launch of the latest instalment in the best-selling series, and as a result we're getting to see more and more of the game in action. There's still no word on a Western release, but the huge delay might have a positive outcome - perhaps Square Enix will add online multiplayer for us lucky westerners? I'm very excited about this game and I hope it will come to the USA soon along with the UK. Hopefully it will receive a U.S. release in the Autumn. I'm also hoping it will have online game play via the Nintendo Wi Fi Connection. Graphics are great, and the gameplay looks fair. What is up with the angel things though? Sweetness. Four-player RPG goodness? Sign me up. I do hope it gets online multiplayer in the West, though. I don't know anybody else who would buy this, unfortunately. I'll likely get this. Looks like some great multiplayer, online or not. This game looks SWEET! I don't play multi-player games too often but this will definitely be an exception! This game looks like a great one! Haha...no. I can't imagine only controlling one guy in a turn-based game while you wait for everyone else to do something as being any fun. Unless you consider making everyone else wait as fun. this game is the second coming of Christ.